Founded by an award-winning educator recognized by President Bill Clinton, Conscious Connections is a behavior management and educational consulting firm serving teachers, child caregivers, nurses, and parents who seek to build highly effective, positive relationships with those in their charge. For school administrators, teachers, and child care providers, Conscious Connections offers teacher workshops, individual and small group coaching, mentoring, curriculum and assessment services, and team facilitation including educational goal setting and reflective supervision training. We are unlike other educational consulting and child care training firms in that we offer fully customized teacher workshops and coaching services rather than canned, one-size-fits-all sessions. 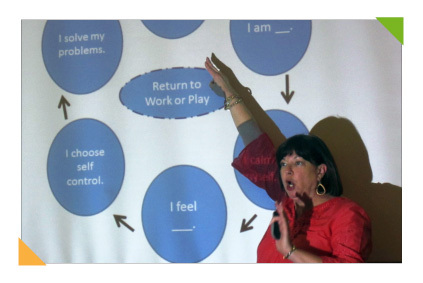 Keynotes and workshops for educational audiences: Conscious Connections founder Kim Hughes offers keynotes and breakout sessions relating to creating a positive learning environment for children up to third grade—and beyond. View our list of teacher workshops and keynotes here. Whether you're an elementary school principal seeking to improve the way your teachers and staff work together to meet school goals, a teacher encountering defiant students or attention-seeking behaviors far too often, or a child care provider facing children out of control on a daily basis, we can help. Read the story of Ashley, a kindergarten teacher who fought frustration when too much of her time was taken up with student discipline issues. Read the story of Zoe, a child care provider who turned around her child care center after years of battling toddler temper tantrums. For parents, Conscious Connections supports families through parenting workshops and parent coaching, including home visits and phone and email consultations as they implement Conscious Discipline® methods in their homes. We guide families as they learn to use effective parenting discipline techniques, particularly with younger children: typically infants to third graders, but at times extending to eighth grade. Whether you're facing toddler temper tantrums or a strong-willed child of any age—or if your goal is simply raising happy children—we can help. Contact us to talk about how we can help you as you work on understanding your children as the individuals they are... and developing better parenting methods for each one. For hospitals, pediatric programs, doctor's offices, and nursing home staff seeking to improve patient satisfaction, Conscious Connections offers individual and group coaching, mentoring, and team facilitation. As with our educational consulting services, we offer fully customized training and coaching services rather than canned, one-size-fits-all sessions. Whether you represent a children’s hospital or a nursing home, many of your challenges are the same, beginning with the need to calm patients who are scared and feel the situation is not entirely under their control. Many of the positive discipline techniques we teach our educational and parenting clients can significantly improve patient satisfaction while reducing the challenges you and your nursing staff experience on a daily basis. Read the story of a pediatric practice where even the best nursing staff was unable to calm patients enough to administer a special test... and the solution they found. Contact us to discuss how we can help you address your specific goals.